This beautifully handcrafted Belleek Irish Pottery Complete Nativity Set. This Nativity set includes Joseph, Mary, Baby Jesus, Shepherd, Lamb, Donkey & a Stable. A wonderful collection of Belleek Nativity pieces made from parian china that will bring warmth and the meaning of Christmas to many a household. Measurements: Complete Set : 15" W x 13.7" H. Mary: 2.7" W x 5.3" H Joseph: 4.3" W x 6.7" H Jesus in a Manger: 2" W x 1.5" H Lamb: 1.3" W x 1.5" H Shepherd: 4.3" W x 6.7" H Star: 1.6" W x 2.7" H. About the Makers When you buy a piece of Belleek China you become the owner of a truly unique piece of Irish craftsmanship. No two pieces are ever the same. Based in County Fermanagh, Ireland, their materials and techniques have been handed down from generation to generation. Every handle, flower and brush stroke is lovingly applied by hand to create the look and feel that is uniquely Belleek. Only Belleek of the highest quality is ever put on sale. When Belleek was established in 1857 the pottery's founder John Caldwell Bloomfield declared that any piece with even the slightest flaw should be destroyed. 151 years later, this golden principle of perfectionism is still strictly adhered to. This beautifully handcrafted Belleek Irish Pottery Complete Nativity Set. Made by the renowned Irish Belleek Pottery, today Belleek Pottery is regarded as the premier solution for all gifting occasions. 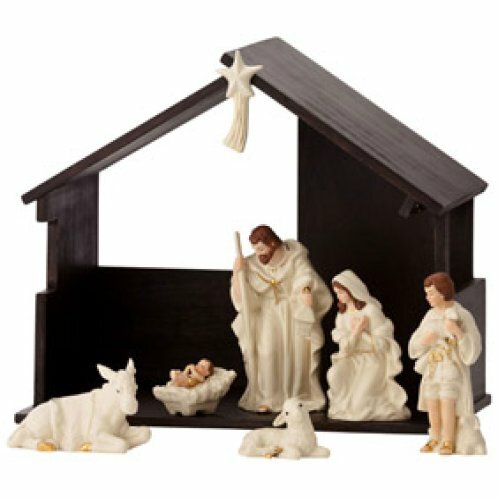 This set consists of Joseph, Mary, Baby Jesus, Star, Shepherd, Lamb, Donkey & a Stable, makes the perfect New Home Gift.